Learn the basics of skating and classic rollerski technique at Castle Combe Racing Circuit, nr Chippenham, Wiltshire. Or join our Level 2 intermediate group to improve, or transfer advanced skills from snow to roller skis. Castle Combe Racing Circuit is a 3km motor racing track, with smooth and gently undulating tarmac. For one day a year skiers replace motorists, with the gentle sound of tapping poles replacing the roar of car engines. As with all our instruction, the emphasis is on teaching with cross-country skiing in mind, so you can ski better on snow, and enjoy the thrills of cross-country skiing, ski touring and cross country ski racing all the more. We run one course at Castle Combe each year, where we are guests of the Wessex Biathlon & Nordic Ski Club. 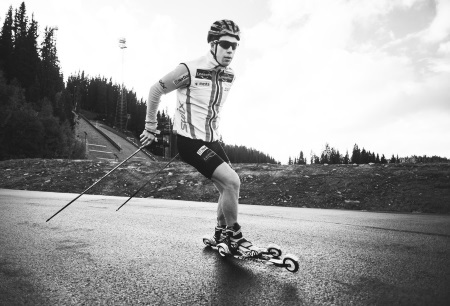 They will also be running roller ski and biathlon races during the day, and the major cross-country ski shops will have stands there. We meet in the main carpark, the entrance to the site is the 'Competitors' Entrance' which should be marked with the Wessex Biathlon sign. 'Team Dorney' training programme, see here. 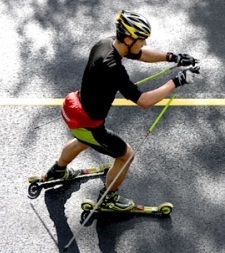 The beginners' course takes you through the basics of both skating and classic rollerski technique. We help you to develop good balance on rollerskis, and for beginners we go through the basic 'gears' of classic and skating techniques. The skating part of the day takes you through the essential elements of the three skating 'gears' - skate 1, skate 2 and skate 3 as well as stopping and turning. On classic you will go through the gears of diagonal stride, kick double pole and double poling. We work hard to develop good balance and body positions, with a number of drills and exercises. After the course, beginners can join the programme of the local Wessex Biathlon & Nordic Ski Club. or join our 'Team Dorney' group which meets at Dorney Lake (nr J7 of the M4). 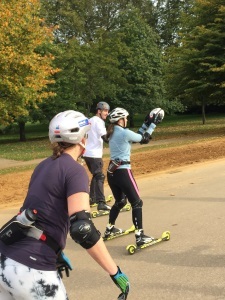 Our Level 2 course focuses on refining technique, and we bring in a lot more exercises for developing technique, on skating and classic rollerskis. These courses are suitable for recreational and racing skiers interested in advancing technically. For beginners, we assume zero previous knowledge or ski experience, but you should have reasonable fitness and balance. If you have any questions, please get in touch. The course is from 10.00-16.00 and you can start to get the equipment from 09.50. Food is not included, and we would encourage you to use the cafe which is on site. We meet in the main carpark by our 'rollerski van'. You can also sign up to just part of the day here. Please bring gloves with you, and a filled in Safety Questionnaire (if you don't have a printer don't worry, we have spares). The Wessex Biathlon & Nordic Ski Club - our hosts - is the most prolific in South West England, and has a great programme of roller skiing and shooting.